Find artworks, auction results, sale prices and pictures of Jules Cheret at auctions worldwide. Sale 2498 Lot 237 JULES CHÉRET (1836-1932) BENZO - MOTEUR. 1900. 47 1/2x33 inches, 120 3/4x84 cm. Chaix, Paris. Condition B: replaced losses, repaired tears, creases and restoration in margins and image and along vertical and horizontal folds. Framed. Broido 1031, DFP-II 201, Cheret 1369, Gold 26, The Poster 56. 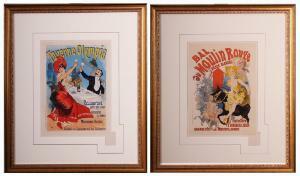 Jules Cheret (1836-1933) French (two) Lot 0039 DetailsShipping & PaymentAuction Terms & InfoLot 0039LES MAITRES DE L\’AFFICHE series, two color lithographs, each with signatures in design, both with blind stamps lower right, both printed by Chaix Paris, images 12 ½ x 9\”, full margins, framed. (2)ConditionBoth in apparently good studio condition. Chéret, Jules (French, 1836-1932). 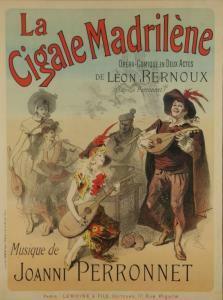 La Cigale Madrilène. 1889. 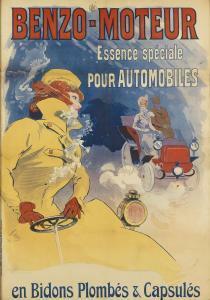 Color lithograph poster. Publisher: Chaix and De Malberbie. Plate: 26" x 19" Sheet: 28 3/8" x 21 3/4" Framed: 36 1/2" x 29 1/4" Jules Chéret is universally acknowledged as the father of the poster. 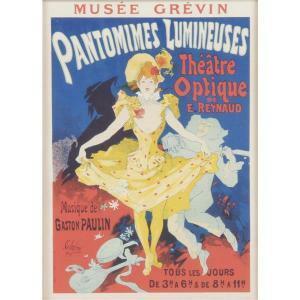 He created his first poster in 1858, for Orphée aux Enfers an operetta, and went on to design more than 1000 images over the course of his career. In the 1880s, Chéret made some tremendous, even revolutionary, innovations in the art of color lithography, but for the first 30 years of his career his posters were essentially red, against a gradated green-blue background. Broido 21, Maindron 19, Chéret 28. Condition: Very good condition. Under glass, not examined out of frame.